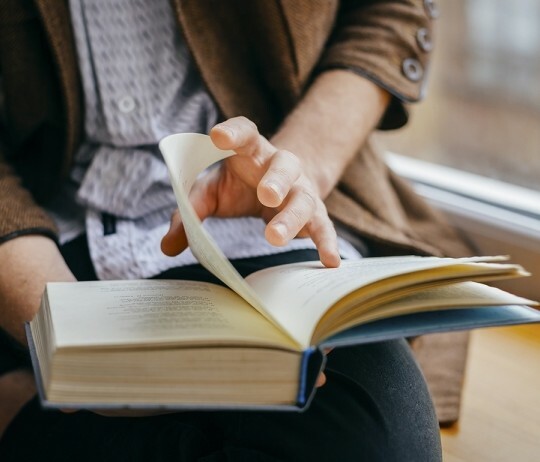 Reading for Understanding: Motivating your students to read and understand course material! Adult students face many challenges during the week apart from your class. For example: traffic accidents, a relative needing help, a baby-sitter that doesn’t show up, a missed payment, and health problems … among other things. So, sitting in class may be a big accomplishment for an adult student … along with submitting any assignments … which may or may not include actually reading the course assignments! One of Belhaven’s “Student Objectives” for Adult Learners is that upon graduation, our students will: “Incorporate ongoing learning strategies toward the fulfillment of their life goals.” One “learning strategy” that must be in place front and center is the ability to read and learn from reading. As faculty, we face barriers in helping students with reading. Students may have a negative attitude towards reading. We are used to receiving “information” easily with the internet, so sitting down with a big book seems daunting. Text books can be dry and may actually be misleading at points or run contrary to the Christian Worldview. How do we cope with student challenges in this particular area? I would suggest three things: expect, motivate, and explain. Let’s start with expect. You should always expect students to read all of the required course material, no matter how daunting. Our classes are short and it is impossible to cover all of the required information in class. So NEVER lower your expectation that students should complete all assigned reading before class. So, we should appeal to students to do the reading because (as mentioned above), there is not enough time to cover all the course material in class, we want them to become lifelong learners, and it is a course requirement. However, Covenantal motivation is also based on “blessings and curses” or, “rewards and punishments.” So, make sure your grading “rewards” students who do the reading and draw from the reading in papers and other assignments … and holds students accountable who fail to draw from class reading in papers and other assignments. Briefly, let’s list some ideas (that you can pass on to students) on how to build those connections! Read in detail, spending more time on text that applies to your priorities and/or course assignments. Note that since you have already gone through all the other material, you don’t need to “stop” and change gears and look at that other material. This should improve speed. Conclude the reading by taking notes that apply to completing assignments. In conclusion, consider taking a few minutes at the end of class to go over next week’s reading and apply 2 or 3 of the motivational and/or practical tips! Pauk, W., & Owens, R. (2014). How to study in college, eighth edition. Boston, MA: Wadsworth CENGAGE Learning. Now You’ve Found the Information, Here’s How To Keep It. I wrote in my last post about the benefit of using an RSS Feed Reader to pull together articles from a variety of sources. Now that you have set that up, you may have already found some articles that were not only informative but you definitely want to keep. Of course, you can cut and past the information, most of the time, into a wordprocessor and save it, however, there is an easier way: Evernote. Evernote is a free (although there are paid versions I have never hit the limits of what the free version can provide) program which exists in the cloud and crosses multiple platforms. What that means is that information saved on my computer is available on my phone, my tablet, my home computer, basically anywhere I have internet access. The great thing about Evernote is that the people there really understand how to maximize the cloud and have created web clippers for all the major web browsers. Simply search for “Evernote Web Clipper” and you can find the version which works best with your browser. Once installed it places the head of an elephant in your browser (see picture to the left – this is using Chrome web browser). When you click that it will open a dialogue box like that to the right. 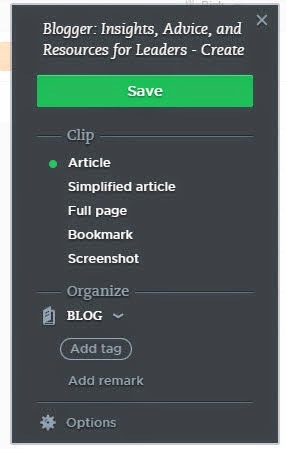 From there you can tell it to copy the article, the page, a screenshot and allows you determine where to save it inside of Evernote. I have set up a folder labeled “web articles” to receive these articles and can choose to read them at the time or wait until later. I can easily share them with others, And, the great thing is, they are there until you remove them, whether that is next week, or next year, or next decade. Using Evernote web clipper and your RSS Feed Reader is a winning combination. It works in the background, takes very little effort, and makes my information readily available when I want it. In the first class, take a few minutes to demonstrate how to use the Belhaven Virtual Library and specifically show the students how to access databases and e-books. Require students to have at least the same number of sources cited within the paper as there are number of pages required for the assignment. For example, if the paper requires five full-pages of text, then there should be at least five sources cited within the paper. Consider requiring that two-thirds of the sources required be taken from the Belhaven Virtual Library. So if they are completing a nine page paper – at least six sources should be from the virtual library and three may be from printed texts. The student should also be expected to utilize only peer-reviewed sources available through the virtual library. On the databases and e-books search function in the virtual library, there is a checkbox to sort the articles to include only peer-reviewed material. Remind students that if a source is not cited within the paper, it should not be on the reference page. Without proper citation within the text, a reference found only on the reference page hints of plagiarism. Explain to students how to use sources. Most references should be summarized in the students own words; direct quotes should be used only for the greatest impact and only if there is no better way to say what needs to be said. If direct quotes are used, the quote should be unpacked with the student’s explanation of how it supports the thesis of the paragraph or the paper itself. If you desire to brush-up on your own research training skills, I recommend The Craft of Research by Wayne Booth, Gregory Colomb, and Joseph Williams published by The University of Chicago Press. If you want a quick overview of it, a professor at George Mason University has provided a summary at http://mason.gmu.edu/~afinn/html/teaching/courses/250_s2002/craftofresearch.pdf . The ability to perform university level research is a critical skill for students to develop. We are the trainers and coaches in this area and it should be our goal to gradually nurture our students in the development of this essential skill.